Read the whole story on This Girl Travels! We begun our last day on the Norwegian Breakaway by sleeping in pretty late (even the 7 year old).. It was warmer then I expected when we got up- we were at the very bottom of Virginia, headed back to New York, and the weather was still OK for shorts and t-shirts, which was a nice surprise. We opened the balcony to get some warm, fresh air while we got ready for the day. After a quiet breakfast while looking at the ocean, a view we are sure to miss this time tomorrow, we dropped the boy of at kids club for about an hour while the husband and I enjoyed a few last moments in the “adults only” hot tub. The deck was subdued, as most people were spending the day inside. However, it was still warm, and it was quite the opposite back home- we were going to get every drop of warmth that we could squeeze out! Afterward, we picked up my son and headed out to lunch before going to watch the International Crew Talent Show, which let the crew show off their stuff. Everything from singing to traditional dances were performed, it was fun, and pretty neat to see what a talented group is on board here. 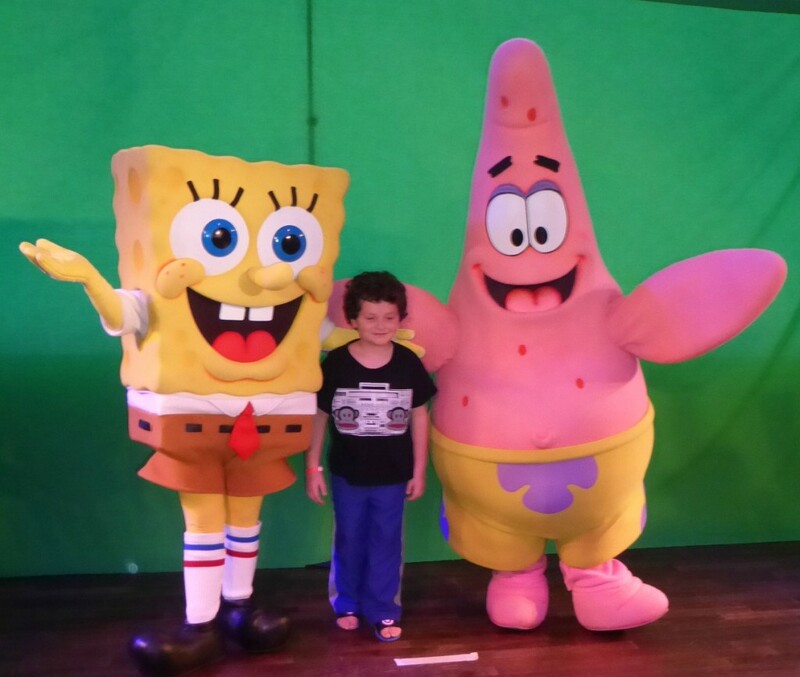 We went to the final character meet and greet- today was SpongeBob and Patrick in their “traditonal” gear. Just about every other day there were different Nickelodeon characters available for photo ops, and to do shows or dance parties with the kids. You are able to take your own photos as well as the staff photographer. I love that we can take our own photos, and have the option to buy theirs as well. Some cruise lines won’t let you, which is one of those “things” that makes me want to cruise with Norwegian again. They don’t nickel and dime you to death. One really cool- pun intended- aspect of the Breakaway is that the ship has an Ice Bar- a whole room made of ice. You are provided with a coat and mittens before you go into this 20 degree freezer, and then served a variety of alcoholic or non-alcoholic drinks in frozen glasses. (Do wear pants and closed toed shoes- unlike my spouse, who refused to listen and later regretted it!) The floor, walls, chairs, and bar are all made of ice- and there are sculptures in the room as well. Kids can go in as well as parents, and get non-alcoholic drinks. The drinks they served were only available there, and in cone-shaped cups made of ice, which is neat as well. You go inside in small groups, so you won’t be overwhelmed (or melt the room). We wanted to make sure to take in one last show (or so we thought) on the Breakaway. They offered a variety of shows, and we made sure we saw each once. Broadway star and former Miss America Kate Shindle sang a mix of Broadway and pop favorites and blew everyone away with her range. 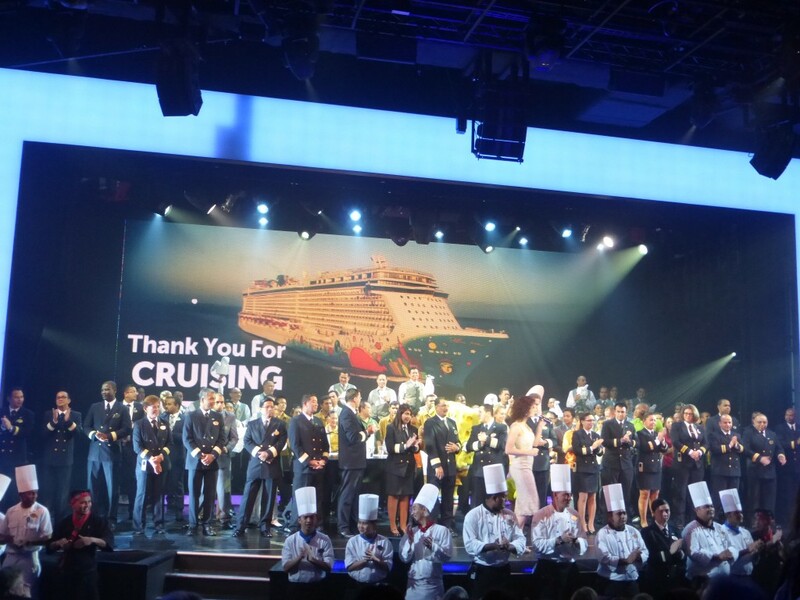 At the end of the show, Cruise Ship Director Julie came on and brought up members of the crew for a farewell number and song- including everyone’s favorites, the Washy Washy Happy Happy singers. What’s that, you say? It’s “that song” that you will have in your head for a week. It’s insane. Then the whole group and audience did the “Breakaway” dance together, and literally danced out of the theater. Great end to a great trip, right? 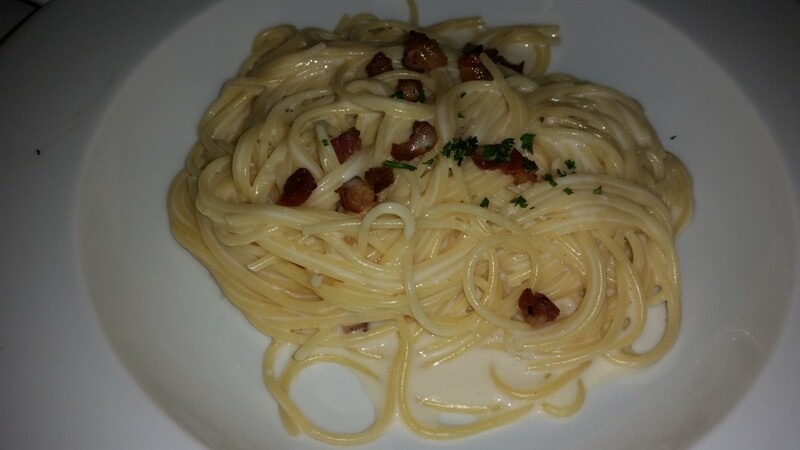 We went to go have a late dinner in the Manhattan Room. I was at first bummed that the singer/pianist from the other night wasn’t there (I was smitten) because that’s why we were eating our last dinner there. 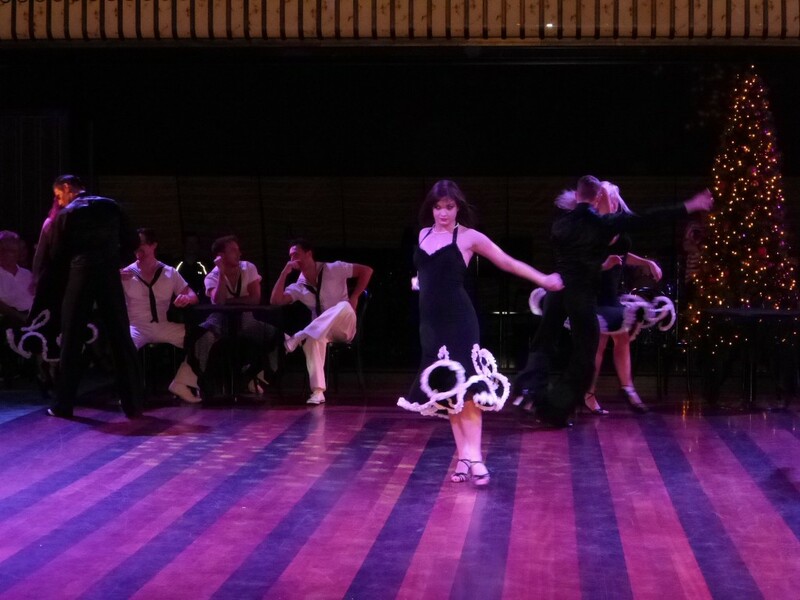 However, as we were eating, the cast from Burn the Floor (one of the shows performed on the ship) came on and preformed some swing dancing! They were fantastic (of course) and so high energy, it’s hard to believe. 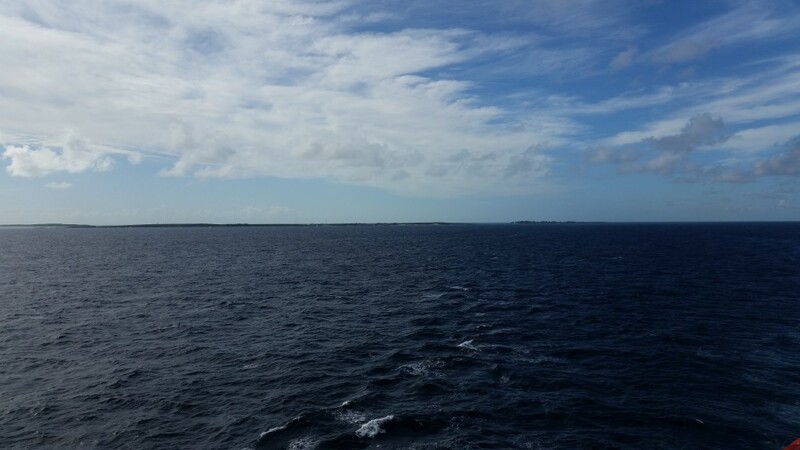 This cruise was absolutely wonderful, we had such a good time. Everyone we met on the ship, from the waiststaff to the characters to the crew members and performers were each so amazing. I find myself using the words “amazing” and “fantastic” a lot, because there really is no other way to describe this experience. 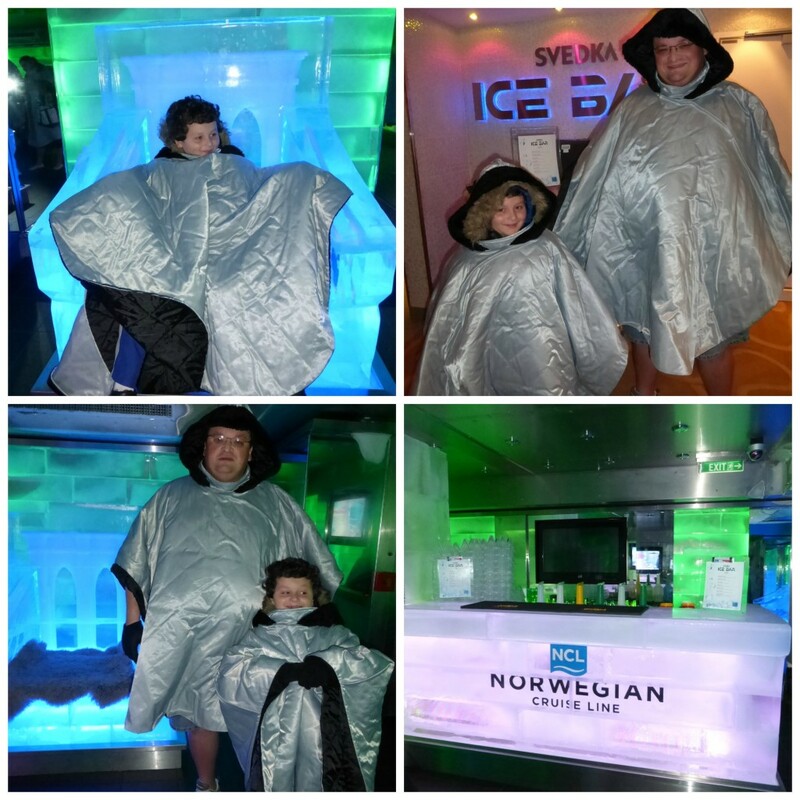 We all had fun, and there was so much to see and do for adults, kids, and even grandparents, that I would tell anyone to book a Norwegian cruise. There is something for everyone at every time of the day, and you will all get what you are looking for out of your cruise vacation. Amazing food, fantastic people, great weather, fun shows, tons of activities and options- what else could you want? Go cruise like a Norwegian and see what I mean. Disclosure- We received press passes to facilitate this review. I love this! I need to go on a cruise. I’ve been on one cruise and would love to go again. Looks like you had a great time.